6th Annual Head/Neck Cancer 5k run/2 mile walk Saturday April 28, 2018, 8am Century Link Park (Hammond Stadium) Ft Myers FL $25 registration fee. First 100 to register get free gift bag and T-shirt 100% of funds raised stay in SWFL to provide free screenings, free community education seminars and financial assistance for head/neck cancer. 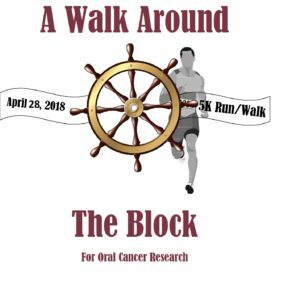 Being a close friend with an oral cancer survivor, students from the VB tech center dental assisting HOSA chapter have decide to coordinate a 5k for oral cancer research and awareness. Volunteering every Monday to see patients in our clinic at the tech center, it has come to our attention that there is an incredible. 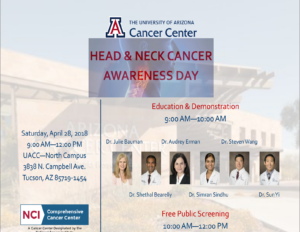 Free evaluation offered to our community and region to screen for head and neck cancer. Both of our Benefis ENT's will be onsite performing the exams. Event is free of cost. Event screening exams provided by Otolaryngology Physicians of Lancaster. Event to take place at WellSpan Ephrata Cancer Center, which is located on route 272 next to CVS pharmacy. Educational information to be provided for high risk population. RSVP and scheduling required. Please call (717) 721-8790 to set-up an appointment. Thank you. University of Arizona Cancer Center – North Campus, 3838 N. Campbell Ave.